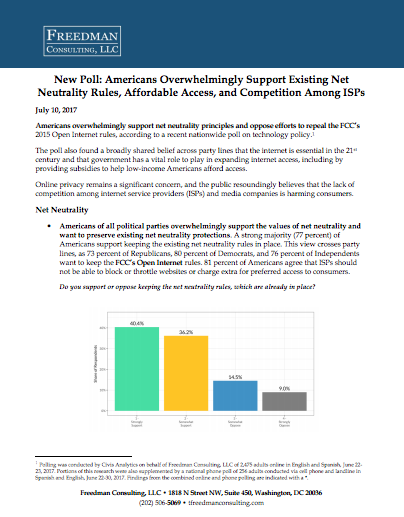 Americans overwhelmingly support net neutrality principles and oppose efforts to repeal the FCC’s 2015 Open Internet rules, according to a recent nationwide poll on technology policy conducted by Civis Analytics. The poll also found a broadly shared belief across party lines that the internet is essential in the 21st century and that government has a vital role to play in expanding internet access, including by providing subsidies to help low-income Americans afford access. Online privacy remains a significant concern, and the public resoundingly believes that the lack of competition among internet service providers (ISPs) and media companies is harming consumers. Check out the summary for more information.